Part of the new economy seems to involve a lot of people doing freelance work, often remotely and generally on a case-by-case basis. I know I fall into that class and it seems that a huge number of the people I converse with on Twitter are also. One of the problems I face is the age old hassle of wrangling timetables, solving calendar issues, setting up video conferencing and (hopefully) being paid. When I was in Israel in December I met up with the founder of vCita, a company that wants to provide an integrated solution to all of those problems. So, What is the business problem vCita is trying to solve? According to vCita founder Itzik Levy, many professionals try to create a web presence and leverage it to grow their business. They write a blog, use social media, and contribute content to expert networks. But only a few actually provide their services online, and effectively benefit from internet communication to acquire new clients and running they business. The idea behind vCita therefore is to help bloggers and experts engage their followers online, and offer meetings and advice. vCita provides an end-to-end solution for communicating with potential clients, scheduling sessions, conducting online meetings or conference calls, and collecting payments for your services. Set an hourly rate for meetings, but also offer free meetings or introductions. All from one single integrated application. vCita is a really useful offering for a bunch of different people – blogger/experts like myself, but also professionals such as lawyers, accountants, financial advisors – pretty much any professional who wish to provide advice online, to engage his/her followers or acquire new customers through introduction meetings. (As a trial – the widget below is a real live vCita widget, linked to my own profile). In terms of cost, vCita is currently in a free beta stage, once that ends vCita is intending to charge users 10% of service fees for utilizing the offering – this fee includes credit card processing and web conferencing fees. vCita tells me that additional pricing plans, including a monthly subscription will be available once Beta ends. I really like the concept of vCita – it would be more useful (for me at least) if it included some functionality like that which tungle.me has – the ability to integrate with Google calendar, set a regular availability schedule as well as daily exceptions. Levy told me that after the meeting is accepted, vCita automatically sends invites to both sides, so it will be on their calendars and that full gmail integration (showing your availability to users when they propose meeting times) is coming soon. Overall, I really see the value of a platform to negotiate, execute and transact freelance interactions – if vCita can crack that nut they’re potentially onto a very big thinkg. 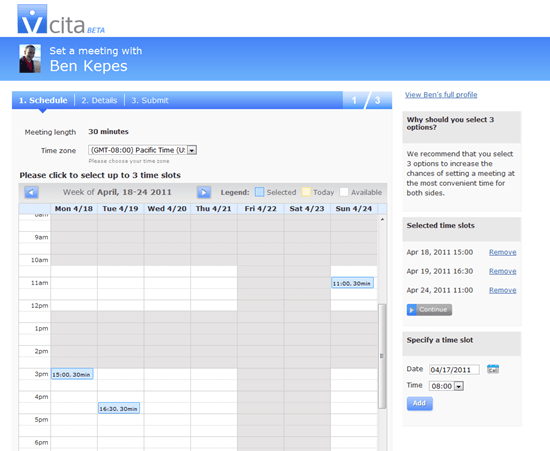 vCita now syncs availability with Google Calendar !